Although federal government spending often gets most of the media attention, state and local government spending is also substantial—at about $3.1 trillion in 2014. Figure 1 shows that state and local government spending has increased during the last four decades from around 8% to around 14% today. 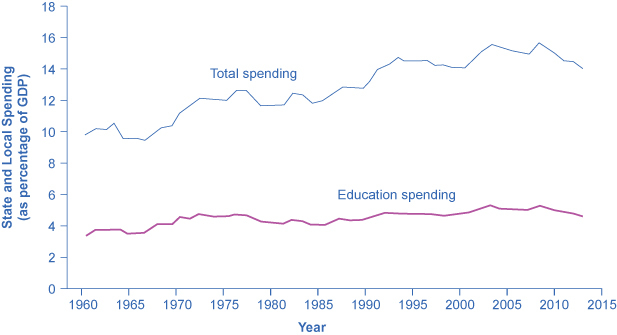 The single biggest item is education, which accounts for about one-third of the total. The rest covers programs like highways, libraries, hospitals and healthcare, parks, and police and fire protection. Unlike the federal government, all states (except Vermont) have balanced budget laws, which means any gaps between revenues and spending must be closed by higher taxes, lower spending, drawing down their previous savings, or some combination of all of these. U.S. presidential candidates often run for office pledging to improve the public schools or to get tough on crime. However, in the U.S. system of government, these tasks are primarily the responsibilities of state and local governments. Indeed, in fiscal year 2014 state and local governments spent about $840 billion per year on education (including K–12 and college and university education), compared to only $100 billion by the federal government, according to usgovernmentspending.com. In other words, about 90 cents of every dollar spent on education happens at the state and local level. A politician who really wants hands-on responsibility for reforming education or reducing crime might do better to run for mayor of a large city or for state governor rather than for president of the United States.